In a nutshell, after the darkness of last year's litany of worst performances, someone's turned on the light. And there are some truly interesting results. Community satisfaction with what Council does showed a general improvement, with significant increases in Overall Direction (+4) - yes!, with Lobbying, Advocacy, Making Decisions and Emergency Management all up by 3. But... satisfaction with Sealed local roads dropped 3 points, Maintenance of unsealed roads dropped 4, and Roadside slashing and weed control fell a whopping 7. The talking point of this survey, though, was the result for "planning for population growth". It surged 5 points to be of top importance for the community (tied with Emergency management) out of all Council issues surveyed, while rating only 47% satisfaction for how it has been handled. 45% of people surveyed said this issue was 'extremely important' and another 37% said it was 'very important' - that's 82%. Planning for population growth, along with Unsealed roads, and Roadside slashing and weed control, are the three areas identified as most needing improvement. Well done to Macedon Ranges councillors for making a difference so early in this term. No matter how hard the previous Macedon Ranges Council tried to make it so, this Shire is NOT a metropolitan growth area and the community doesn't want it to become one. All State and Federal political parties please take particular note. (19/7/16 - C) Community loss of confidence in Council is confirmed in falls in overall council performance, overall council direction, advocacy, lobbying, making community decisions, consultation, planning, and how council is handling business and tourism. Many 2016 satisfaction scores are the worst of this Council's term, and worse than the previous (2012) Council. Time to throw out this failed Council, and our CEO. The Community Satisfaction Survey (available from Council's website) provides Index Scores (out of 100) in 27 Council performance/service area categories (two of these - 'Condition of sealed roads' and 'Making decisions on behalf of the community' - were added in 2015). Community views on both performance, and the importance of each performance area, are included in the Survey. Until now, 2014 had been the 'black' year of satisfaction for Council, but 2016 sets some new lows that make some of 2014's bad results look good. 2016 Survey results are in fact the worst or equal worst of this Council’s term in 16 of 27 categories, and are worse than results for the previous (2012) council in 17 of 25 categories. This year Macedon Ranges Shire residents sent an unmistakable message that Council's performance and direction aren't what residents want. In 2016, Council took a 6 point fall in community satisfaction with 'Overall council direction' (to 48), and 'Planning and building permits’ plummeted to 43 (7 points below both Large Rural Shire and State averages). ‘Town planning policy’ slid to 48, while ‘Lobbying on behalf of the community’ and ‘Business and tourism’ fell 4 points. 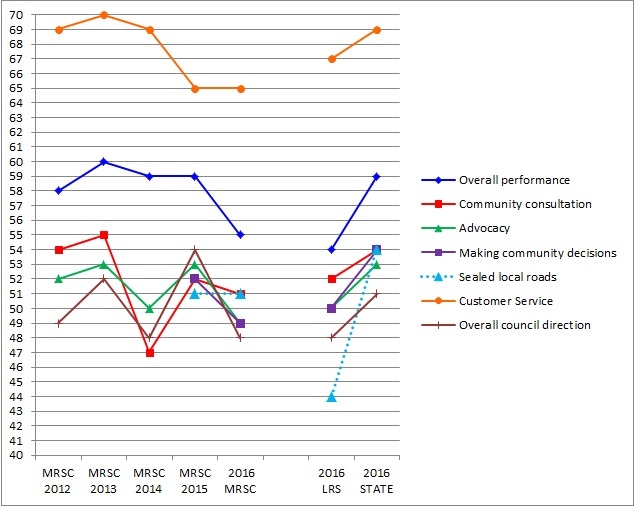 Even Customer Service at 65 points, and which Council prides itself on, is lower than the previous (2012) Council's score (69), is equal lowest of this Council term, and is below both Large Rural Shire and State-wide 2016 averages (67 and 69 respectively). There are significant falls in community satisfaction with Council’s “core” performances including ‘Overall performance’ (-4 to 55 points), ‘Overall council direction’ (-6 to 48), and ‘Advocacy’ (-4 to 49). Three of seven of Council's “core” performance results fall below 50 points and, overall, 8 of 27 results are below 50 points. Council also lags up to 5 points below State-wide averages in all 7 “core” performance areas. Council's PR media response confines itself to measuring 2016 results against Large Rural Shire averages, saying Macedon Ranges did better than or was consistent with those averages. It also (unbelievably) blames talk of rate-capping for falls in all Large Rural Shire and State performance averages (additionally ignoring the fact that some Large Rural Shire and State averages rose or stayed the same as 2015). The Survey itself understates the situation, saying “Council is not performing strongly on many individual service areas” (page 11). It identifies 12 areas where Council's performance lags more than 10 points below the importance the community assigned to it, with 'Maintenance of sealed roads' 30 points behind, and "Planning permits' (29), 'Population growth' (27), 'Slashing and weed control' (26) and 'Consultation and engagement' (25) points behind. RResidents in East Ward were happier (or happiest) with Council's performances in several areas, with West Ward residents consistently unhappy, and some 'significant' unhappiness in key areas in South Ward. Highest scores were 'Appearance of public areas' (up 2 to 71 points), 'Waste management' (down 1 to 71 points), and 'Emergency and disaster management' (down 3 to 70 points). Lowest scores were 'Overall council direction' (down 6 to 48 points), 'Planning and building permits' (down 5 to 43 points) and 'Town planning policy' (down 2 to 48 points). Overall, Council improved in 4 areas. Best improvements were 'Roadside slashing and weed control' (up 5 to 51 points), and 'Appearance of public areas' (up 2 to 71 points). Council fell below Large Rural Shire averages in 13 performance areas, and was above in 9. Council was also below State-wide averages in 21 areas, and above in 4. Few would need convincing that this Shire needs a new Council and - importantly - a new CEO. These survey results are the straw that breaks the camel's back and evidence of a failed Council that not only doesn't represent its community, it ignores it. It's a Council that then "spins" its way out by denying and lying about the results. Don't worry about what a Council is supposed to do, about the only things this Council excels in is misrepresentation and obstruction. The things a good Council should do well run a long last in this Council's priorities, and performances. The extra money Council put into roadside slashing last year produced favourable results. Imagine what might have happened if Council had put the money it wastes on its Tokai junkets, rubbish reports and white elephant economic development projects like the Equine 'Everything' Centre into what really matters to the community. Only a few Councillors would be worth keeping at the upcoming Council election; the rest must go. Jennifer Anderson is pretty-much universally seen as the role model for the type of councillors we need, and somewhere out there must be a CEO capable of producing better satisfaction levels than these. Time for a change for the better. It starts October 22nd, and the new Council's first task must be getting a new CEO. The good news is, 2012 Community Satisfaction Survey results are available for Macedon Ranges. The bad news is, these results can't be measured against previous years. Annual Community Satisfaction Surveys began in 1998. They are run by the Department of Planning and Community Development, and survey residents about their Council's performance. Results are presented as percentages, and a weighted rating. This year the Survey changed. More, and more specific, issues were addressed, and responses are presented by ward, gender and age. The importance residents assign issues is now published and incorporated into weighted results (index scores), and changed methodology means that previous Survey results cannot be compared with 2012 weighted ratings. However, the Survey includes results for all councils in Victoria (State), as well as the "Large Rural Shires Group", of which Macedon Ranges Shire is a member. This at least allows Macedon Ranges Council's 2012 (weighted) indexed scores to be directly compared with 2012 State and Large Rural Shires Group results, and with where the Shire stood relative to other areas in 2011. Does parking, appearance of public areas, waste management and economic development better than other places. Falls between State and Large Rural Shire results in Overall Performance, Community Consultation and Engagement, Informing The Community, Customer Service, Council Direction, Local Roads & Footpaths, Maintenance of Unsealed Roads, Enforcing Local Laws, Recreation Facilities, Community and Cultural Activities, Planning Population Growth, Emergency & Disaster Mgt., Town Planning Policy. Is performing badly at Advocacy, Roadside Slashing/Weed Control, Family Support Services, Elderly Support, Disadvantaged Support, Art Centres/Libraries, Planning/Building Permits. Achieved some very low approval ratings, with planning/building permits, planning for population growth, town planning policy and maintenance of unsealed roads all scoring 50 or less out of 100. Click here for an overview of results, and the big ticket items Council needs to address first. Click here for an overview including results for wards. Click here for full 2012 Community Satisfaction Survey results. NB The only place MRRA has found these results is as an attachment in the Council Agenda for 29/8/12, as Item CX2 Attachment. Warning: this is a large 5.8mb file. (10/8/08 - C) Planning, local roads and footpaths are "key improvement areas", with community engagement "act here next"
The latest Local Government Community Satisfaction Survey, run by the Department of Planning and Community Development, has been released. These surveys are conducted annually for municipalities throughout Victoria, sampling 350 residents in each. According to the results, this year the only major (weighted) improvement noted for Macedon Ranges is in the Advocacy category (perhaps due to the survey coinciding with Council's win in the Supreme Court on the Romsey pokies issues in March this year). Other areas which showed improvement (unweighted) were Overall Performance (+2%), Community Engagement (+4%), Human and Health Services (+3%), Economic Development (+4%) and Town Planning Policy and Approvals (+6%). The areas where community satisfaction fell were Customer Contact (-1%), Local Roads and Footpaths (-6%), Appearance of Public Areas (-3%), Traffic Management and Parking Facilities (-12%), Waste Management (-1%), and Enforcement of Local Laws (-2%). The areas with the lowest satisfaction ratings were Local Roads and Footpaths (43% satisfaction, -6% in 2008), and Town Planning Policy and Approvals (46%, +6%). Note: 'satisfaction' with planning has been below 50% since 2004 (53% in 2003). For the results in Macedon Ranges to have a context, DPCD provides ratings for comparison with other municipalities in the Large Rural Councils group (of which Macedon ranges is a member), and all Councils in the State. This puts a different perspective on Macedon Ranges' performance. less in 7 of 13 categories: Community Engagement, Customer Contact, Local Roads and Footpaths, Health and Human Services, Waste Management, Enforcement of Local Laws, and Town Planning Policy and Approvals. Overall Macedon Ranges' ratings were significantly lower than those across all Councils. The only two categories where Macedon Ranges came out ahead at a Statewide level were Advocacy (78% v 77%) and Traffic Management and Parking (67% v 65%). Macedon Ranges rose 4% in Advocacy whereas Statewide there was a 2% fall, and Macedon Ranges fell 12% on Traffic Management and Parking whereas Statewide there was only a 3% fall. The overall picture is of mediocrity - that is, a Shire struggling to achieve and maintain acceptable standards in a number of categories, and particularly, struggling to find any form of consistent improvement over time. Macedon Ranges lags behind in most categories when compared with other large rural shires, and falls well short when compared with Statewide standards. The lowest ratings (below 50%) point to an urgent need for a concerted effort to make major improvements. Click here for a simple summary of Macedon Ranges results. It is almost unbelievable that there is actually a Shire in the Large Rural group that is worse than Macedon Ranges, but it seems there is!!! The really critical area for Macedon Ranges is (again) planning, highlighting what an important issue it is to most residents. It isn't just a problem this year, it has always been a problem. The kindest thing that can be said about Council's performance in planning, since amalgamation, is dismal. It is to be hoped that after the November Council election, the Shire will have a majority of Councillors who understand planning (as opposed to those who use it for their own purposes) and will at long last lift the Shire from being almost bottom of the heap. This document is available from Council's website at www.mrsc.vic.gov.au. We aren't quite sure who is being counted as 'new residents' but it seems to include people who are moving around within the Shire (i.e. who already live here but change residential address). There is a snippet of information about population growth at the front of the report. The Shire's growth rate has dropped from an average of +2.0% per annum between 1996 and 2001, to +1.2% between 2001 and 2006. The report then tells us something MRRA and quite a number of residents already knew. Between 2001 and 2006 greatest growth in the Shire has occurred in Gisborne (3.9% per annum) but Romsey (3.7% per annum) and Riddells Creek (3.0% per annum) are only a little way behind (ABS 2006 census). These three towns account for 94% of growth in towns and 76% of Shire growth. Thus almost all growth in population is occurring in the south and south east of the Shire, in the towns closest to Melbourne. That high growth in Gisborne is probably the result of developers having the town by the throat back in 2003/2004, when Gisborne residents were outraged by the mountain of cheap, suburban subdivision applications and approvals (not least by VCAT) that overwhelmed the town. It was a signal moment, because at that time the developers' fever for more and more squeezy lots pointed to Gisborne becoming the "Black Hole of Calcutta", bursting at the seams with a surfeit of people. Sadly for many of those developers, their greed cut their own throats. There were so many nasty, over-priced lots that replicated Melbourne instead of reflecting Gisborne, the over-supply of what people don't want soon saw impoverished developers struggling to sell them, and having to build spekkie Melbourne-style houses on the lots in the hope that would move them. As you do. And it's only going to get worse with higher petrol prices. We could commiserate with the developers, but we wouldn't mean it. Latest Community Satisfaction Survey Of Council's Performance Should Start Bells Ringing On Parking and Planning - Alarm Bells! (10/6/06 - C) The survey shows Council made slight improvements in Customer Contact and Health and Human Services but Macedon Ranges' residents have said they don't like what's happening in other areas with satisfaction levels slumping to 43% for planning, 54% for community engagement, 46% for local roads and footpaths, and 59% for traffic management and parking. The 2005/2006 Community Satisfaction Survey for Macedon Ranges was released at Wednesday's Finance and Operations committee meeting. Council made small performance gains (+1%) over last year in only two areas: Customer Contact (69%) and Health and Human Services (70%). Enforcement of By-Laws stayed the same (62%). Overall Performance (58%), Appearance of Public Areas (65%) and Economic Development (55%) all dropped 1%. Community Engagement (54%), Local Roads and Footpaths (46%) and Waste Management (64%) all fell 2%. Recreational Facilities (64%) went down 3% while Advocacy (57%) and Traffic Management and Parking tumbled by 4%. But the winning ticket for biggest drop (and lowest score) was Town Planning Policy and Approvals (43%), which plummeted by 5% from last years unstunning performance. Click here to see an overview of survey results, or go to Council's website (www.mrsc.vic.gov.au) and download the full report. How bad is planning in Macedon Ranges? In this survey, our Shire is included in the 'Large Rural Shires' group. For that group, Macedon Ranges came in at 43% satisfaction rating, and the lowest rating for the entire group was also 43% - so we can assume Macedon Ranges had the lowest rating. Here's the punch line: Also in the Large Rural Shires group is Glenelg Shire. Yep, the Shire that last year had its planning powers frozen and was under investigation by the Federal Police and the Victorian Auditor General. Community satisfaction with planning in Macedon Ranges is either lower than, or at best, equal to, that in Glenelg Shire. The area identified by the Macedon Ranges community as needing the most improvement is 'better policies', although if all of the categories that together relate to dissatisfaction with bad outcomes and Council not listening to the community are added together, they get the biscuit. (10/6/06 - C) Why they come here isn't a surprise: rural lifestyle and natural beauty wins hands down. A report about new residents coming to Macedon Ranges, prepared by Dr. Lorraine Beyer of Council's Social Planning Unit, has produced some interesting findings. Rural lifestyle and natural beauty were well ahead as reasons why people choose to live/purchase here. Closeness to Melbourne was well back in 3rd place followed by being near friends and family. Here's where the surprises started: affordability and good investment came in at 6th and equal 7th, and even more surprisingly, tree change and retirement followed at equal 7th and 8th. Adults with no children comprised 67% of new residents, but only 14% relied on pensions. Another surprise was 72% had lived in a rural area before, and 47% have bought a house on more than 0.5 hectares (1 acre) while 8% went for a flat or unit. Only 45% said they or someone in their household will commute to Melbourne and 51% said they at best would only travel to Melbourne occasionally. Over a third of survey participants said they planned to use public transport to get to some services in the Shire, even more said they planned to walk, and only 20% said they would use services for children between 0 - 11. MRRA has not been able to find the report on Council's website but anyone wanting more information can contact Council's Community Planning Unit or try Angie Laussel, Manager Community Development, on 03 5427 8249. Just a brief alert to remind residents to make sure you fill in the survey sheet in the May 2006 Macedon Ranges' Update magazine, being delivered to all Shire households now. Council is asking for your views on what you most value about living in this area. It's an opportunity too good to miss, so go to it! If you need a copy of Update, contact Council on 5422 0333.